Two Wookiee Warriors join the Rebel Alliance with the Wookiee Warriors Ally Pack, and they’re prepared to destroy any who stand between them and the freedom of their species. A new campaign side mission gives you the chance to demonstrate the foolishness of angering a Wookiee, and invites you to call upon the Wookiee Warriors in later campaigns. Your skirmish strike teams can also reap the benefits of an alliance with the Wookiees. These trained warriors are fearsome in a brawl, and the addition of a new skirmish map only offers more opportunities to vanquish your foes. 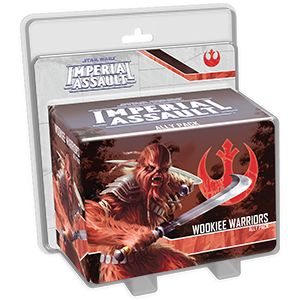 With new Command cards to support your strike team, the Wookiee Warriors Ally Pack is a worthy addition to any skirmish list. This is not a standalone product. A copy of the Imperial Assault Core Set is required to play.